The beautiful city of Kochi has always been a shelter for many generations of visitors, especially refugees. It has always welcomed people with generosity, humility and with open arms. One fine example of this hospitality is the Mattancherry Synagogue. More popularly known as the Paradesi Synagogue, it is the oldest synagogue in the commonwealth of nations. To better serve the Jewish community which was growing in number, in 1568, the Paradesi Synagogue was constructed in the Mattancherry area of Cochin. The Raja of Cochin Rama Verma generously allotted land to the Jews in Cochin da Cima, or Upper Cochin, next to his own Dutch Palace . By this point, the membership of the community consisted of a core that had migrated from Cranganore along with a larger group who were relative newcomers from Europe and Western Asia. Because of these new refugee Jews coming in from various regions, it was named as the Paradesi (Foreigner) Synagogue. One step into the Synagogue’s divine halls leaves a person mesmerized with the rare antiques and architectural marvel on display. The natural sunlight enters the room through big windows and are deflected at various angles creating beautiful patterns on the walls and floors. Glass chandeliers adorning the ceiling were imported from Belgium back in the 19th century – another remnant of Kochi’s multicultural heritage. Each tile on the floor is unique and different from each other. Each hand-painted blue willow patterned tile is special and one can feel a distinct mystical aura emanating from the entire place. The centre of the room houses a pulpit with brass rails for sermons, with a carved teak ark. It also contains four scrolls of the Torah that have been encased in silver and gold, as well as two gold crowns – special gifts from the Kings of Cochin and Travancore. Special 4th century copper plates gifted by the King of Cochin containing inscriptions in Malayalam describing the special privileges given to the Jewish Community are also on display. 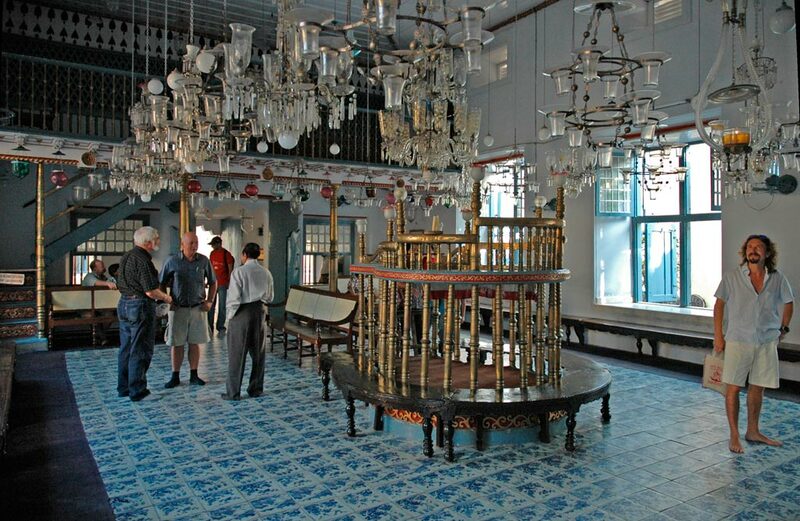 The Jew Synagogue in Cochin is one of the few remaining of its kind in India and holds a significant historical presence for the Jewish community in India. In 2018, The Synagogue celebrates its 450th anniversary on December 6, with more than 100 guests expected to arrive from Canada, America, England and Israel. The Paradesi Synagogue is located next to Dutch Palace and the Mattancherry Boat Jetty is just 400 metres away from this place. How to get there - The Jew Synagogue is very near to Ernakulum town and is well connected by ferries. The place is just a 5-minute drive from Hotel Forte Kochi. Check out these 15 must-do things in Fort Kochi. Forte Kochi - a luxury heritage hotel from the creators of Kumarakom Lake Resort.